My name is Matt Winick, an Asian American from Ann Arbor, Michigan with a strong interest in learning history, social justice, and public policy. In these subjects, I like to learn the importance of making Civil Rights stronger to reduce discrimination, protect the environment from pollution, improve social justice to help people, and many others. 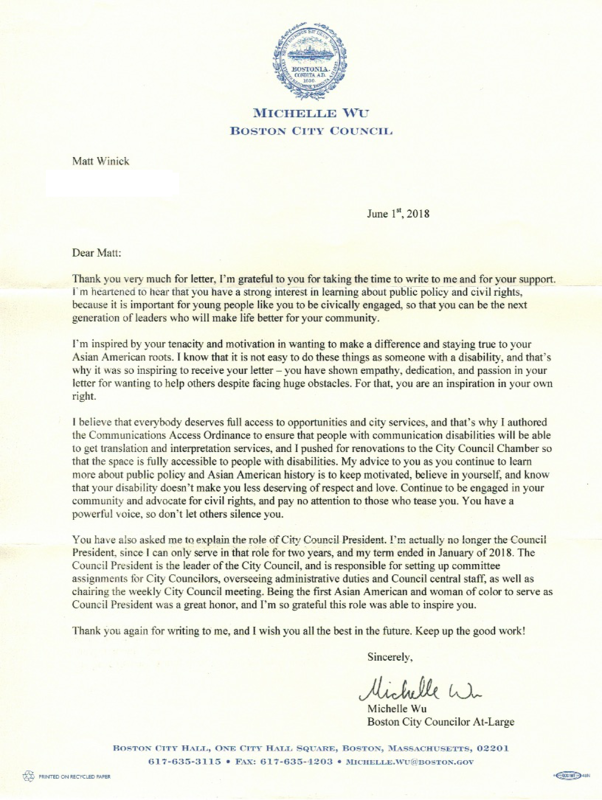 City Council President Wu, the main reason I’m writing you a letter is to explain how I find your role as Boston City Council President and as City Councilor At-Large of Boston City Council to be very inspiring to me. In November 2013, I was amazed on how you made history by becoming the first Asian American woman to serve on the Boston City Council. Also later in January 2016, I was very proud on how you made history on becoming the first woman of color to become Boston City Council President. On Civil Rights, I like on how you advocate for people with disabilities’ rights, support funding women including minorities businesses to help them compete in the economy, express the need for women to have equal pay, and support LGBT rights. Working with members of city council and Mayor Marty Walsh to expand on job-training programs to help train youth including workers to develop job-skills in order to prepare them for the work force and support the need to raise the minimum wage to help minimum wage workers afford to live are great ways to improve the economy. To improve education, I like your approach like fund special education to help students with disabilities get educational resources they need to assist them on learning, expand on arts including diversity programs to help teach people the importance of diversity in society, and push for after-school programs to help students get assistance on their assignments. Providing funds for Asian American communities to help repair them, implementing diversity programs to help educate people about Asian American culture, advocating for Asian American with disabilities’ rights, and pushing for resolution to help spread or recognize Asian American culture are great ways to help the Asian American communities. To protect the environment, I like on how you work on encouraging small businesses including industries to use energy-efficient products to reduce polluting the environment, pushing for funds to clean parks including water resources to make them safe for people to use, and supporting funds for renewable energy projects to reduce addiction to oil with gas. Another thing that I like about your current role as City Council President is how you sponsored Boston’s Paid Parental Leave ordinance to give paid leave for parents who work for the city when they have a child and authored Boston’s Communication Access ordinance which provides assistance technology which has translation or interpretation for people who struggle to speak English or have a communications disability. City Council President Wu, I have autism with a learning disability. Having a disability is hard for me because I have trouble comprehending on learning different subjects, sometimes I struggle to communicate my thoughts, and get teased. Your commitment to be a strong supporter of Civil Rights and your continuous advocacy for people with disabilities’ rights really inspires me to work hard on my disability. Also being an Asian American with autism is very difficult for me because some Asians including some Asian Americans tease me about having a disability including how they believe that I don’t meet their standards. However, your role as an Asian American public official, support Asian American with disabilities’ rights, and help Asian American communities along with other issues related to them gives me motivation to continue to be proud to be an Asian American even when I struggle with a disability and to develop an interest in learning Asian American including Asian culture with history. My letter is a gift to you for inspiring me and for May Asian Pacific American Heritage Month to recognize Asian American individuals who work hard to make a great difference for society. Also your role as City Council President and as City Councilor At-Large of Boston City Council gives me motivation to continue to learn history with social justice. I strongly believe that you are making a great difference for society including the Asian American communities in your current role. I’m very proud on how you are working hard to improve Civil Rights, find ways to make social justice a better place, and many others. You have inspired me to work hard on my disability, continue to be proud to be an Asian American when I face struggles, and to continue to learn history with social justice. I was wondering if you could please share some advice about working hard on a disability and explain your role as city council president. Thanks for taking the time to read my letter, making a great difference, and inspiring me. I wish you well in your current role to continue to make a great difference for society and the Asian American communities.